Whether you have taken time off since college or are switching careers, writing a resume that highlights your accomplishments and work experience will be fundamental to landing a new job. If you are not a recent graduate, you will likely have more work experience, and potentially more gaps or career changes which your résumé should address. Prompt offers numerous techniques to help you leverage your work experience on your résumé, and stand out amongst the competition. Most recent graduates open their résumé with a brief Education section. If more than ten years have passed since you received your highest degree, you can prioritize your work experience instead of education, and move this section elsewhere. Here, you should include the name of your university, dates attended, and your degree. Follow similar formatting as the example below. This candidate includes academic honors in his Education section, but you may also have an Honors section if you have enough accomplishments. Have you been working on your own blog, or otherwise building a strong social media network? Have you contributed to open source projects? Have you participated and had an impact in any advisory or board positions? Have you worked on large-scale projects? Have you held leadership positions outside of work? While your professional experience should take priority, you could also consider including additional sections if you feel they will work to your advantage. If you graduated more than two years ago, you should not include undergraduate activities on your résumé. However, if an activity in which you participated during college has continued in a different form, you may include it. For example, if you were a varsity athlete and now spend weekends coaching a basketball team, you might include it under “Hobbies.” Similarly, if you developed a passion for community outreach during college and now devote a significant amount of time to volunteer efforts or mentorship programs, you could include a Community Service section. Do not include awards unless they are extremely prestigious, or directly related to your field. Academic awards from college should not be included unless they were incredibly selective and demonstrate your early proficiency in a field. Do not include a language section unless you are proficient in multiple languages. Those two semesters of Spanish are probably not worth mentioning, but if you are applying to a job in global communications, you absolutely should include a section about your language proficiencies. Many employers will value candidates who speak multiple languages fluently, so if you are multi-lingual you should absolutely mention your language skills. Some candidates try to add character to their resume by including a brief hobby section. But be prepared: if you list “telling jokes” as a hobby, have a joke ready for your interview! A hobby section can give a reader a more personal idea of your interests, but remember to be brief and only include this section if you have space. Résumés written in the Regular format look more like conventional résumés. Instead of showing experience and education in chronological order, the time frame over which experiences and education occur are shown on the far right of the résumé next to each item. The advantage of using this format is that you can fit more information onto the page. The disadvantage is that it is easier for your résumé to seem cluttered and difficult to read. If you have ample relevant experience and need the space, use the Regular format and make sure to leave enough white space and stick to the standard 1'' margins. 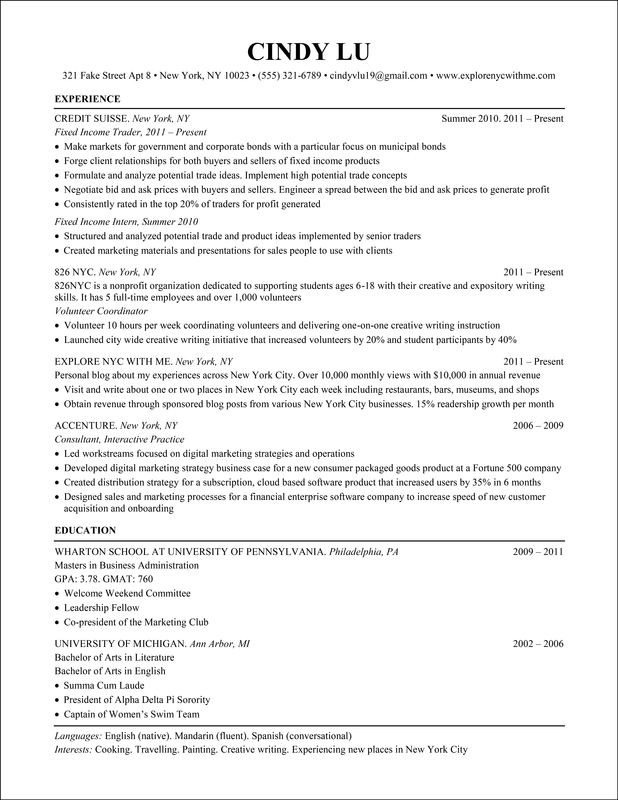 Click here for a template for writing a résumé with the Regular format: Regular Résumé Template. The Experience section is located before the "Education" section, which is because Cindy has more recently been in the workforce rather than in school. Cindy uses the Regular format, as she has plenty of experiences and content to choose from. Her résumé would take up too much space if written in the Timeline format. The Experience section contains quantitative evidence of good performance in the bullet describing her consistent position in the top 20% of traders in her past work. Employers love seeing measure of performance whenever applicants are able to provide them. The Experience section includes her participation in 826NYC and Explore NYC With Me. Although these are not full time jobs, Cindy should include them because she spent a significant amount of time on both and they show her drive and entrepreneurial tendencies. Aside from base level education information, the Education section includes only highly relevant activities and exceedingly impressive academic awards. The lack of a Skills section is acceptable if Cindy has no highly relevant skills. Generally, the Skills section should be left out if the only items that the applicant can write in the section are very general and common skills like "Microsoft Office" or "Can type at 90 words per minute." Since you should include the amount of time you spent in each position, your reader will be able to tell if there are any gaps in your résumé. If a significant personal event changed the course of your career, or required you to take time off from working, you can clarify these gaps in your cover letter. However, you should also make sure to include every relevant experience you had during those gap years. For example, if you are applying to a job in marketing and spent several years as a freelance marketing consultant while you raised a family, include that experience. Applying to a new job after having significant work and life experience should never be a liability. By using dynamic language, emphasizing your impact, and presenting a clear, streamlined resume, you will demonstrate to potential employers that you are committed to your field. Let your experience work in your favor!